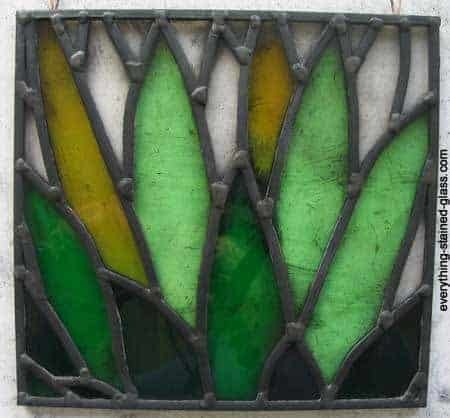 The final step of stained glass making really adds class to your panel. It is done after the black cement has dried and hardened. The cleaning gets rid of any black cement that has squeezed out from under the lead came during drying. The polishing blackens the lead and the solder joins and makes the whole panel sparkle. Black graphite polish (grate blackener) available from stainedglass suppliers, two shoe brushes, fid, wooden skewer (or similar), dust mask, latex gloves, newspaper, dustpan and brush. How far you go with this process is up to you. Some people spend ages on it, others prefer the ‘softer’ look of a leaded panel that has rounded puttied corners. – Trace around the shapes with the wooden skewer. – Use the fid to remove any hardened black cement that has squeezed through during the cementing process. – Brush off any dry bits of cement. – Hold the panel up to the light or put on a light box to make sure you have scraped off all the cement. 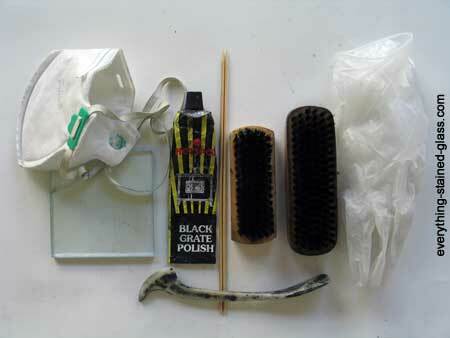 – Squeeze a bit of the black graphite polish onto a piece of scrap sheetglass. – Dab one of the shoe brushes into it. You don’t want to get too much on to the panel. – Brush along the lead came, taking care to cover the solder joints. – Leave for half an hour to allow the graphite polish to dry. – Take the other (clean) shoe brush and brush both the stained glass and lead came. – This needs quite a lot of effort. Work at it until you can touch the panel without getting black fingers. I have made a panel which will be installed in a bathroom. How will the blacking survive in a damp steamy atmosphere? Is there any likelihood that it would run off onto the wooden frame? If you polish within an inch it will be fine. It shouldn’t run off at all. 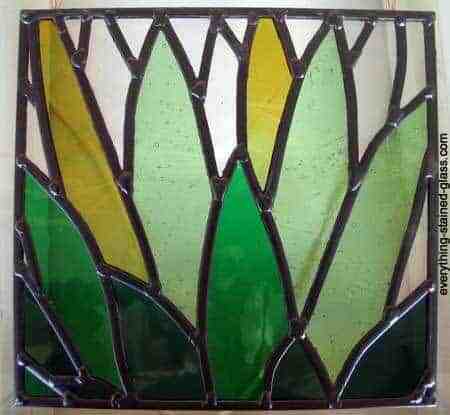 If it’s an internal window and there’s existing glass in the window you could leave that in and install the stained glass window on the other side of the glass. This will protect it from the steam. I want to use black patina on my recently finished lead came project. Should I do this before or after cementing? You need to do the patina last, after the cementing and cleaning up. Thanks for your question Loren. You don’t have to blacken the leads. You can polish them up just as they are and they are grey. It is nice to do this sometimes as it does make a difference to the panel, as you say. Thanks for your question. I wouldn’t use anything – just brush up to get all the whiting off, let it dry, pick it out with a wooden stick and give the stained glass panel a final brush up. Good question Judy, thanks. Hi Gail, I always cement as I like the look of it and feel that it finishes it off nicely, but no, you don’t have to if it’s a small piece (say 12″ X 12″) and is hanging inside. Anything larger will need the rigidity that cementing brings.